Say hello to Amethyst, the second in the Birthstone Series. I loved stitching this one, the textures come out cooler than I'd planned! And of course it's purple. 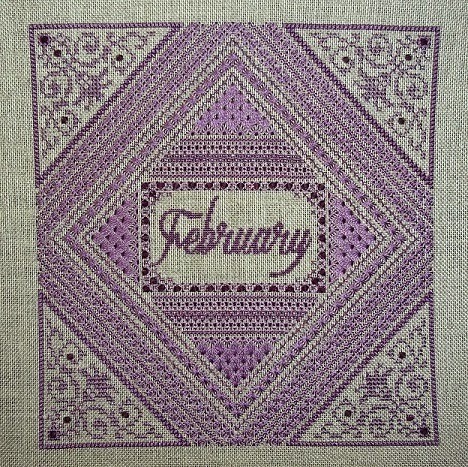 The design is a small one, 100x100, but it's jam packed with specialty stitches, Delica beads and Swarovski crystals. 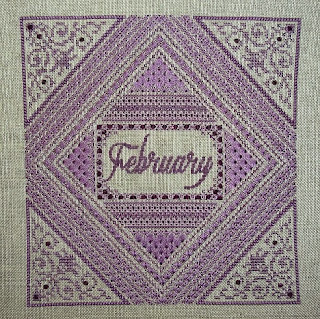 The chart also includes instructions and mock ups for combining months together to make them into a wedding or anniversary sampler, or stitch them all together for one (very) large design. Very pretty! Can't wait to see the rest of them!